Cirque Du Soleil once again made my jaw drop while stealing my heart. KOOZA combines acrobatic performance and the art of clowning in a perfect way. I laughed until my sides hurt, left smiling and simply amazed. This show is a must see and is currently making it's last US stop in St. Petersburg. In between the acts, the entertainment kept the guests on their feet. This was unlike other Cirque acts I have seen which go seamlessly from one act to the next. It was a fun addition as the actors had us cracking up. 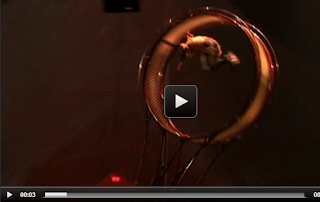 On Cirque Du Soleil's website, you can see a short clip of all of their acts. Below are my 5 favorite from the show and they are the reason you need to see KOOZA before it heads to London. You better hurry, the final day of KOOZA in the US is December 16. Unicycle duo: juggling another human while staying balanced on a unicycle. Amazing contortionist, if I didn't see this in person, I am not sure I would have believed it for my own eyes. Chair balancing I couldn't do this on two chairs, let alone 10+! I still don't understand how this is possible. The most insane moment of the night - the wheel of death. This act is worth seeing the show alone. Talk about a standing ovation. To purchase your tickets, visit Kooza's official site by clicking here. Through December 16th, showtimes are as follows: Wednesdays to Fridays at 7:30 p.m.; Saturdays at 3:30 p.m. and 7:30 p.m.; and Sundays at 1 p.m. and 5. It was such an amazing show -- I've been telling everyone to go see it before it's gone!